Gary Presley: Looking for a Late-Minute Christmas Gift? Looking for a Late-Minute Christmas Gift? Despite its title, a thoughtful person shouldn’t consider this book only as a gift for someone in the medical field. No, this is a book an introspective person might offer to a kindred spirit. To read this collection of essays is to acknowledge the essence of St. Paul’s supposition that there are “angels among us.” And they need not be celebrated like Mother Teresa or the Dalai Lama. The essay “Toenails” illustrates that, as the essay “Imelda”—” she pressed to her mouth a filthy, pink, balled-up rag as though to stanch a flow or buttress against pain”—reminds us that angels sometimes have rough edges and tattered wings. 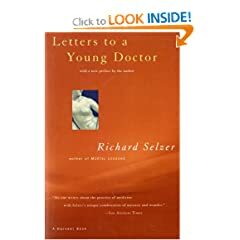 If your “thinker”—the kindred spirit who receives the book—gives you a hug and a whispered “thank you” after reading Letters to a Young Doctor, you can turn to more of Selzer’s profound work for the next occasion. There are eleven other volumes waiting to be gift-wrapped. Nearly every word illustrates what it means for us to be spirits immersed in these strange fragile bodies. Already have it? I'll send a signed copy of my memoir, Seven Wheelchairs: A Life beyond Polio, to those who want to purchase it directly. Contact me here on the blog with your email address.